games from the late '70s. Foto-Electric. The two opponents would select their plays from see-though cells. a magnet underneath the base of the featured player. show cartoon football imagery and the results of plays. Soccer, Baseball, Basketball, Hockey, Sub Hunt, Battlestar Gallactica and more. series for Playstation were just around the corner. The classic Mattel and Coleco games are almost always in working condition even today. find and can bring as much as Mattel's football 2. 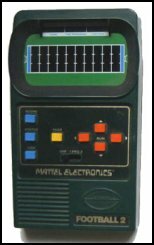 Note: Mattel has since rerelased it's Football Handhelds.